Pluto and Charon (left) seen by the New Horizons probe (their predicted positions are circled on the right). Sure, they’re fuzzy dots, but they’re awesome fuzzy dots. And they won’t be just dots for long. File this under “OK, this is pretty cool”: The New Horizons spacecraft, currently just under 900 million kilometers (550 million miles) from Pluto, took its first picture of Charon, Pluto’s largest moon! In the picture, Charon is to the upper left of Pluto. In the right-hand frame, the circles mark the predicted positions of the two objects given the positions of New Horizons, the two worlds, and the pointing of the camera. Not bad. 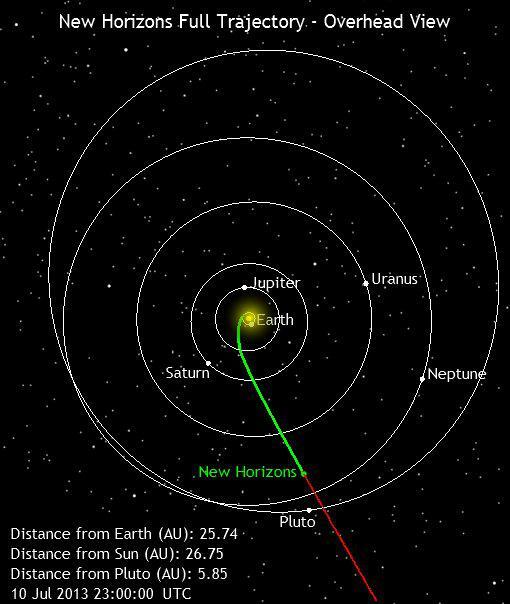 New Horizons was launched in January 2006, and will zip past Pluto and its retinue of moons in July 2015. It still has a long way to go; 900 million kilometers isn’t exactly an afternoon stroll. It’s well past the orbit of Uranus now, and even though it’s moving at a fantastic 15 kilometers per second (32,000 miles per hour, fast enough to cross the entire Earth in 15 minutes) it still has two years to go. The outer solar system is big. The trajectory of New Horizons, which is currently out past the orbit of Uranus. Spare me the obvious comments, please. That’s why Charon wasn’t even discovered until 1978, and even then it was just a bump on the side of a grainy, fuzzy photo of Pluto. It wasn’t long after that time that digital detectors made their debut, allowing telescopes to see far fainter objects. Now, using Hubble, five moons are known to exist around Pluto: Charon, Hydra, Nix, Styx, and Kerberos. More might be out there; perhaps New Horizons will discover them. Pluto is tiny, only about 2300 km (1500 miles) across, smaller than Earth’s moon. Charon is about 1200 km (720 miles) across. From 900 million kilometers, the two are difficult to separate, but New Horizons’ high resolution camera can do it. The image above is actually a stack of six separate images, which allows fainter objects to be seen. The total exposure time was only 0.6 seconds. This image shows that New Horizons is on the job and performing well. The most important thing to me is that the predictions of the locations of Pluto and Charon were dead on; this is a fly-by mission, and the spacecraft will scream through the Pluto system at high speed. It will need to be pointed very accurately if we’re to get high-resolution images. Pluto has been an enigma for a long time—my whole life, and more. It’s hard to believe that in two short years, we’ll have images of it good enough to be used for your computer desktop. And we don’t know what we’ll find! It’s been speculated based on some observations that Charon might have plumes of water erupting from the surface, for example. What a thing that would be to see up close! Still, patience. Judging from this first preliminary image, we’ll know a lot more soon enough.